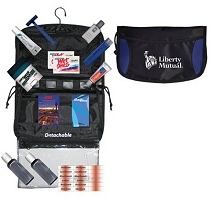 We have a custom promotional first aid kit for Everyone! Our factory has specializes in producing the most comprehensive line of custom logo promotional emergency kits, custom logo auto first aid kits, custom printed travel promotional first aid kits, logo printed outdoor first aid kits, promotional golf first aid kits, trade show promotional first aid kits and custom printed first aid kits for conventions in the industry for 10 years while maintaining the balance between quality and price. Need it quick? 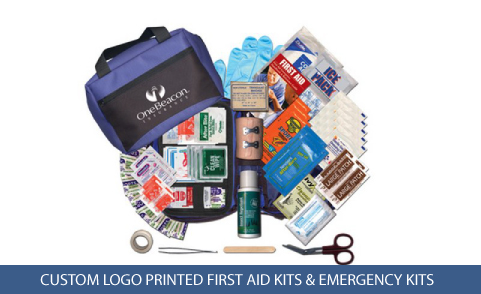 Our promotional first aid kits can be shipped in 1-3 days with your one color custom logo! 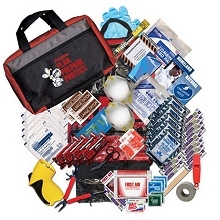 Our factory will CUSTOMIZE any of our emergency kits or first aid kits to fit you and your clients exact needs. If there is a fill item you don't see here and would like inserted into the kit we will be happy to accommodate it. 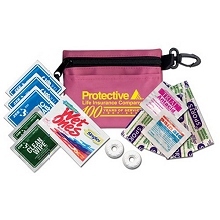 Constructed of a variety of durable nylons, our promotional first aid kits are filled with selected brand name items chosen to provide the user with years of use. 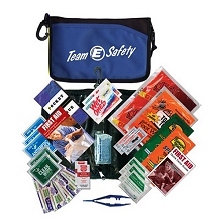 All of our promotional first aid kits are easily refilled with items from most pharmacies, convenience or department stores ensuring that your logo and message stays in front of your clients and customers for years to come..
Our factory also offers custom imprints to ensure that your logo will be easily recognizable and attractive.